In winter when we think of wildlife often hibernation comes to mind. However decomposers are active throughout the winter months. Many decomposers are invertebrates (species without a backbone), they turn organic material such as autumn leaves or the waste in our compost bins into fertile compost for growing plants. 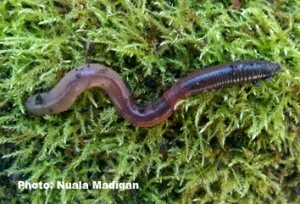 An earthworm (péist talún) is an example of a decomposer. The earthworm has no limbs but its body is divided into segments. Each segment has bristles called setae, earthworms use these to move. The bristles anchor the earthworm so muscles can push the earthworm forward or backward. The earthworm has three main body parts the head, tail and clitellum. The clitellum is the thickest part of the earthworms body and holds the earthworms organs. An earthworm has both male and female reproduction systems and therefore can be described as a hermaphrodite. The earthworm lays eggs and in Spring young earthworms appear thread like and white in colour. As the earthworm grows its body will develop colour and by Autumn the earthworm will have reached maturity. Earthworms don’t have lungs so they breath through their skin. For this reason earthworms prefer damp environments as the moisture helps them to pass dissolved oxygen into their bodies. Peatlands have great preservative properties. The high water table limits oxgyen in a bog and therefore prevents earthworms from living in them. With no earthworms and few other decomposers this makes bogs the perfect place to bury an item you want to protect from decomposition. A comment that many young people make is ‘when a worm is cut in two it will grow back’. This is only partly true. For example if while digging you cut an earthworm in two and the head and the clitellum are connected, then yes the earthworm has potential to regenerate as the main organs of the earthworm are located in the clitellum. However,, the tail will not as it now has no functioning organs. This entry was posted in Wildlife Watch at the Bog of Allen Nature Centre and tagged Activities, Attraction, biodiversity, Conservation, Events, Gardens, Places to Go, Things to Do. Bookmark the permalink.